We loved the pitch perfect 80's action movie parody Chuck Steel: Raging Balls of Justice. So naturally, we were thrilled to hear that the team were working on a feature length follow up Night Of The Trampires. 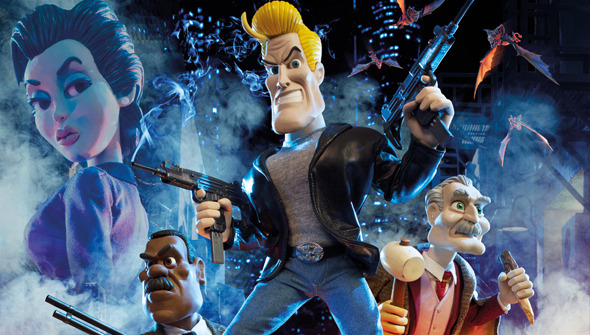 The stop-motion film is currently in production at Animortal Studios, and now the first teaser has been released. The short sent up the conventions of 80's action movies, and that's going to continue in the new film. Chuck Steel is going to continue his lifestyle as a "cop who doesn't play by the the rules" but "always gets the job done" and other assorted cop movie cliches. His long-suffering boss is back too. As hinted at in the sequel's title though, there's an extra supernatural element this time around. That's right- Chuck finds himself up against vampires. But not just any old vampire... these are Trampires (tramp-vampires). Despite the short running time, we get a good idea of what this is going to be like. This riffs pretty heavily on the classic Michael Jackson music video Thriller, but we can be pretty sure that will just be one of the many references we get in the finished result. If this lives up to the promise of the short, we're in for a treat. 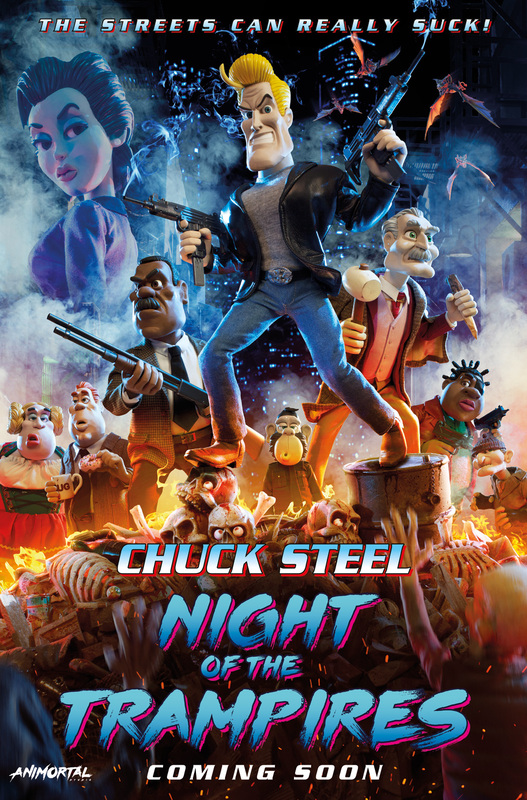 Chuck Steel: Night Of The Trampires will be released in 2017. The producers will be giving a work in progress presentation at this year's Annecy festival. Official synopsis: "IT’S NO LONGER 1985 – IT’S 1986, AND CHUCK STEEL HAS WORK TO DO IF HE IS TO PREVENT THE WORST PLAGUE EVER TO HIT LOS ANGELES – A SCOURGE OF DEADLY TRAMPIRES, MUTANT HYBRIDS OF VAMPIRES AND BUMS."